Brihadeswar Temple- Architecture at its best!! The Hindu temples in India follow some fundamental rules for its construction from ancient times to till date. Centre of the temple is sanctum sanctorum or Garbhagriha, usually square-sized, houses the temple deity. A pyramidal structure rises above the sanctum sanctorum which symbolizes the Meruparvath (or Meru mountain) � the abode of Gods as per Hindu belief. By the passage of time the Indian temples evolved itself into two main styles; Nagara and Dravidian. These styles can be distinguished by the shape of their Shikharas and on the plan of its layout. 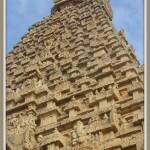 In Nagara style, prevalent in North India, the tower or Shikhara is beehive or curvilinear shaped. 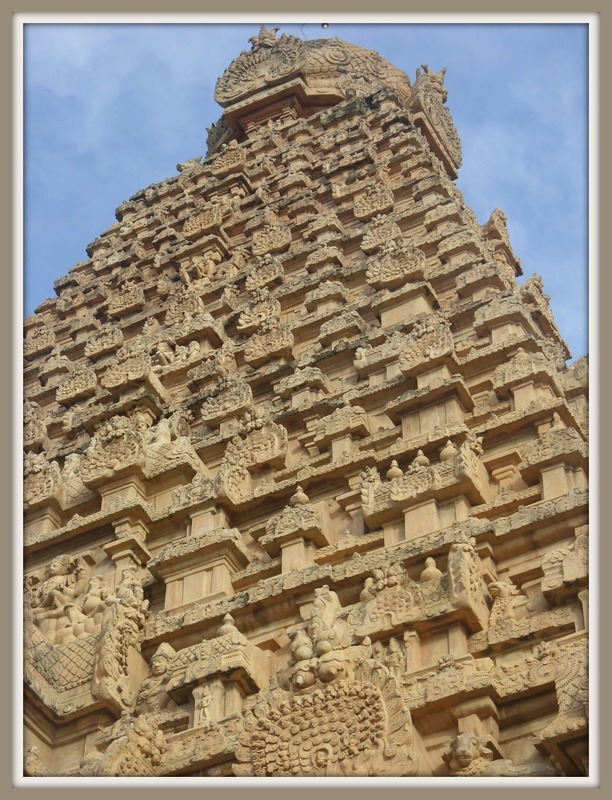 In Dravidian style, prevalent in South India, the Shikhara (please note that Shikharas are not to be confused with Gopura which is only a gateway) consists of progressively smaller layers of pavilions. In plan, Nagara style temple lay-out is a square with a number of graduated projections in the middle of each side giving a cruciform shape with a number of re-entrant angles on each side. The Khandariya Mahadeva temple of Khajuraho is the specimen of this style. In plan, Dravida temple lay-out invariably comprises of three parts. First is the Garbha Griha� which houses the idol of the deity. Over the Garbha Griha� there will be a lofty pyramidal structure known as Vimana or Shikhara. The second one Mandapam or porch in front of the Garbha Griha is a pillared hall used for various purposes and a third Gopuram or Gate way protecting the outer walls of the temple structure and serving as the entrance to the temple. The Meenakshi temple at Madurai is the specimen for this style. Meanwhile, a third architecture style known as �Vesara� also gained popularity in Deccan. It is the fusion of Nagara and Dravidian style.� The Later Chalukya Dynasty and the Hoysalas used it extensively. It gave prominence to elaborate sculptures on the walls, depressed ceilings, lathe-turned pillars and fully sculptured vimanas. Temples at Belur, Halebid and Somanathpura are specimens. The cultural diversity of the country is also reflected in its Hindu temple architectural styles. There are many regional architectural styles distinct from Nagara or Dravidian styles. 1. Terra-Cotta Temples in Bengal:- Due to the lack of suitable stone in the alluvial Gangetic delta, the temple builders had to use other materials instead of stone. This gave rise to using terracotta as a medium for temple building. Later on many styles were evolved within the terra cotta style. For example the Navaratna style or Pancharatna style. The Dakshineswar Kali temple in Kolkotta is a good example of the Navaratna style. 2. The Kerala Style: – Temple architecture of Kerala has a unique style. It is marked by the extensive use of wood and red stone. In fact the ancient temples of Kerala has more wood than stone on it!. These wood panels are usually rich in sculptures depicting puranic and natural themes. To take care of the heavy monsoon rainfall, the roof generally slopes down. Sree Vallabha temple at Tiruvalla near Kottayam is a good specimen to the traditional Kerala Hindu temple architecture. 3. Maru-Gurjara Temple architecture, Rajasthan:- This style came into prominence in the 6th century around the present day Rajasthan. Many scholars are of the view that this style has a distinct existence independent of the Nagara style that is popular in North India. 4. Goan Temples: – Due to the destruction of Hindu temples by the Portuguese, idols of the deities were taken out of the Portuguese ruled area. Many new temples were constructed out of Portuguese Goa making these idols the principal deity. Thus most of the Goan temples are less than 500 years old. The architecture of these temples are a unique blend of original Goan temple architecture, the Dravidian, Nagara and Hemandpanti style with a touch of Islamic and Portuguese� on it. But, if you still want to see the original Goan temple architecture, please visit the Saptakoteswar temple which escaped the wrath of the Portuguese rule. Besides those listed above there are many other regional variations to the Nagara and Dravidian style of architecture.